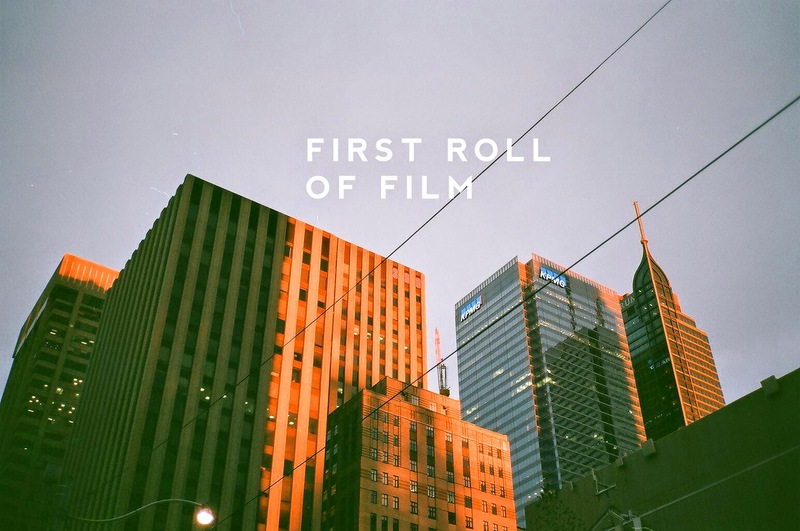 First Roll of Film ~ this anomal life. Thanks to Bellamy Hunt at Japan Camera Hunter, he sourced a beautiful Contax T2 for me. I put a roll of Fuji Superia 400 in it and started shooting with downtown. I was in love with the results. Let me tell you that I will be leaving my DSLR at home when I go on my downtown Toronto outings. I processed the film in Wal-Mart for $10 ($5 to develop, $5 to scan). Unfortunately, they will no longer develop 35mm film starting in February 2015 :( Here are some of my favourite shots from the roll. Osgoode Hall. I realized that a lot of my shots are crooked...gotta work on that. The quality of these scans aren't great but aren't completely terrible. Until I find another place that processes film, Wal-Mart will have to do! The Contax T2 is basically an aperture-priority camera. It has very simple functions--a dial at the top to choose between full auto mode or manual focus, an exposure compensation dial, and a beautiful Carl Zeiss Sonnar 38mm f2.8 lens. You can rotate the barrel of the lens to choose your aperture and flash if needed. The camera auto-detects the film speed that you're using and as far as I know, there is no way of pushing the ISO. I used up the roll on two trips downtown. On both days, I was lucky to have really nice golden hours. All shots were handheld. This particular one (and others in this roll) were actually taken on 1/30s shutter speed. I was afraid that it would be blurry but I guess it's not grossly blurry. I really liked this shot. More pics with these guys later! Definitely the best picture from the roll. We were walking past Toronto General Hospital when this guy and his buddy went to cross the street to the Hasty Market...with his I.V. pole! I didn't have time to take the picture because I was holding ice cream on one hand. I started walking away from the hospital and I turned around to chase him into the Hasty Market. By the time I got there he already came out so I asked him for a picture and he posed like this. It was awesome and I'm glad this shot turned out. Really awesome sunset after a super cloudy day. Quality golden hour. I love the tones. Catching the train back home from Union Station. Loved the lighting on this shot as well. Overall...I'm in love with this shooting setup. Loving my first adventures with film! More to come. I still have a roll of Superia 400, Portra 160, Tri-X 400, and a three pack of Kodak Gold 200.